KoopaTV: Should Nintendo Go Into Virtual Reality? By LUDWIG VON KOOPA - I dunno. What the heck do you expect? Depending on who you ask, virtual reality (VR) is going to be the biggest thing to ever happen to the videogame industry, or it'll be an over-hyped, money-sinking disaster. That said, every company is looking into it, and it's the biggest thing, I think, that people are talking about from the Game Developer's Conference (GDC) this week. Yeah, I'd be a terrible gaming writer if I didn't mention GDC this week. 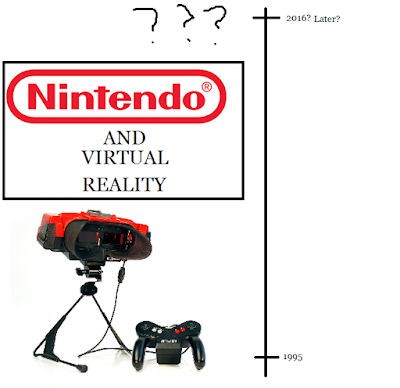 Nintendo is looking at virtual reality technology as well, within its research and development. We aren't just talking about the Virtual Boy, either. Will they formally enter the arena? I have no idea. I know a few things, though. One, developing for it is really hard. Not all of your traditional game design experiences will necessarily transfer, which is why companies have dedicated VR divisions or are VR-only. It's something you need to specialise in. Considering Nintendo had so much trouble doing HD development and 3D graphics on the 3DS, I kind of doubt Nintendo's... let's call it, ability to hit home-runs on new technology. General game design fundamentals? Nintendo is the best in the business. And a lot of these "bad" VR experiences want to show off the technology and are less about good game design. There's room for excellence there that Nintendo could bring if they knew what they were doing. 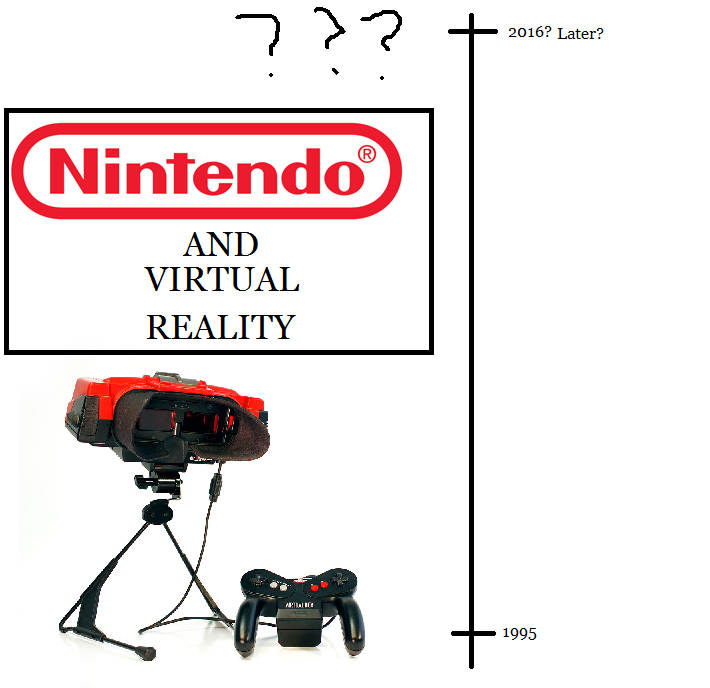 A timeline of Nintendo and Virtual Reality. This is one of those, “Here's a picture for the sake of having a picture.”pictures. As a kid, my fantasies about where gaming would go next was that we'd go to Virtual Reality. I mean, that just sounds so cool and it makes sense for the natural progression of things. And if companies ignore it and don't invest in it, and it does take off, they'll be playing catch-up and that's not the position you want to be in. Invest in it and get that experience and proficiency in how to develop for that, just don't commercialise it. It'll be rough right now. I lean on the "Virtual Reality is over-hyped" side, as it stands now. One day, it will be the standard. I don't think it's anytime soon. (I'm not an expert analyst or anything, though.) And not in its current form. Virtual Reality is obviously too big a topic to cover in just one article, but this is generally Ludwig's opinion of it that's been a thing for a few years now. He hasn't really been following Virtual Reality developments and kind of doesn't care. No one ever asked him what he thinks about it, and he's taking that as a lack of interest from other people, not that no one cares what Ludwig thinks. ...What do YOU think? Three years later, it's finally revealed that Nintendo is going into virtual reality with the Nintendo Labo. The Labo VR Kit has been released, and it's a tool for evil. Personally, I have little interest in VR. You ain't ever dreamed about it? "That would be so cool!" I would be feeling anxious. I would like a degree of separation between my video games and real life. I mean, Virtual Reality would still be different. You're thinking of Augmented Reality (AR), I think. But it's through your eyes, right? For these first-gen headsets, you won't be able to actually see yourself. So would you really feel like you're IN it any more than you do already via immersive techniques?